I really wanted to pick this game up and just try it out and what I ended up realizing, was that it was a thoroughly made game. Matris incorporates many memorable themes for the iconic classic, Tetris; a title which forced our mind to think quickly and maneuver oddly shaped objects in place. Matris brings back the same nostalgia I had with that title but amps it up to the 20th century. No more falling blocks with the same song on auto repeat. With Matris you get a choice of multiple maps, multiple game modes and a multi soundtrack to boot. The game play is what you would expect from Tetris, but the maps and different game modes transform this Matris into something more. I can only imagine if we would have had this game 15-20 years ago instead of the original. Matris goes beyond the simple logic of Tetris and introduces other critical thinking situations to the mix. Matris gives you a grid, and within that grid you must create blocks. These block pieces are the strange shapes we are used to seeing from Tetris but Matris goes a step further. It gives you a predicted number of blocks that could be created on the selected map, so its totally up to you to try and achieve that number, but the further you get along on a particular map, the more you realize how much space you are wasting. The graphics are fine with Matris and I love the fact that they decided to keep it simple but not dull. Vibrant colors with eye catching transitions make the gameplay a great experience. For this type of game, you don’t want over the top, because it tends to be a distraction. Whats It Sound Like? Any Catchy Tunes? The sound in this game is really decent, Matris gives you a random track list of songs that cycle through your gameplay that both sound unique and pleasant. No quarrels here with the sound department, everything seems well executed. Overall Matris delivers a wonderful experience with my only gripe, is I wish this to be available on mobile devices. 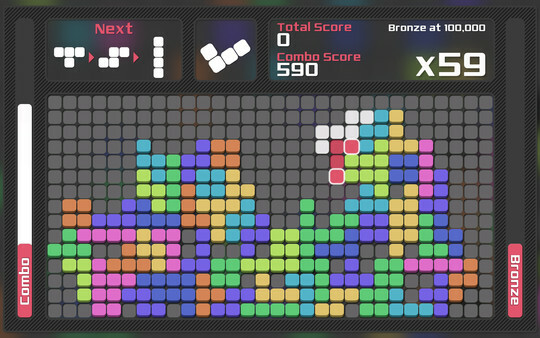 A smart new way to enjoy the charms of an old classic of Tetris never gets tiring. With its cheap price tag and addictive personality, I would say Matris has a fighting chance to end up on many Steam Users library this year.